On March 19th, Claire’s Stores (“Claire’s”), filed Chapter 11 bankruptcy as a strategic way to restructure its high debt load related to a 2007 leveraged buyout (“LBO”). Managing its debt has limited Claire’s ability to reinvest and adapt to the changing market place. 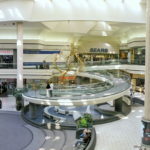 It should be no surprise to property owners that Claire’s filed for bankruptcy protection and proactive contingency plans should be in place for possible lease terminations. 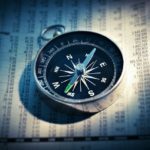 Knowing a tenant’s industry—how it’s performing nationally, regionally, and internally—can guide commercial property owners in making critical leasing decisions. (RE)meter rated and identified, Claire’s as an “Extreme Risk” tenant, dating back to 2012- an ongoing alarm for landlords prepare for significant store closings. A recent (RE)meter Industry (RE)port found that Claire’s should be monitored on a corporate level, as well as by individual store locations. How Did (RE)meter See What Others May Have Missed? (RE)meter was able to rate Claire’s financial strength, the economic health of its industry, and rent affordability against 7,181 U.S. stores competing within the Clothing Accessories Stores Industry. Why so hard on CLAIRE’S? 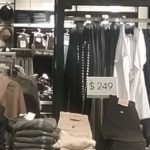 The bottom line is the retailer is not able to generate enough operating profits to afford its lease obligations and individual stores are not maintaining performance standards. Claire’s has gradually reduced its store count from 3,085 (February 2013) to 2,710 (January 2017), however, the retailer’s individual store performance was still unsatisfactory according to (RE)meter’s latest tenancy rating. Sales and profitability per store are deteriorating. 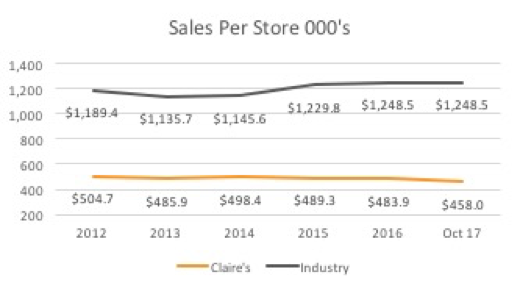 (RE)meter found that Claire’s store sales have declined by 9.3% since 2012, while those of its industry peers have increased by 5% during the same period. Employee productivity is declining. 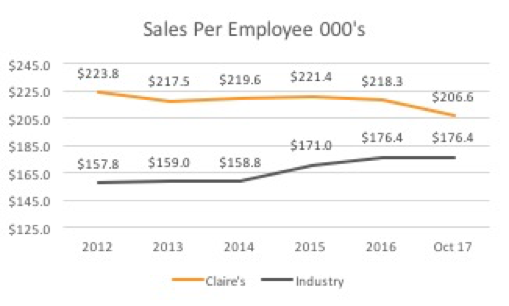 Although Claire’s sales per full-time employee is still above industry average, it declined from $223.8K in (February 2013) to $218.3 in (January 217), while its industry increased from $157.8K to $176.4. Claire’s decreased productivity may suggest its inability to adapt to changing market demand. 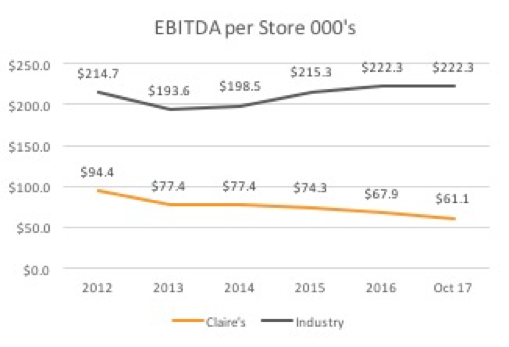 Other factors contributing to Claire’s extreme-risk rating, besides a weak balance sheet, include declining market share and reduced productivity in its leased locations, when compared to its industry peers. 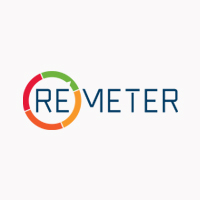 (RE)meter’s recent Industry (RE)port also considers operating profits, growth and rent affordability when determining a tenant’s overall health and stability. In each of these areas, Claire’s shows reason for concern. Scott Openlander, Co-founder of (RE)meter, explains, “Good retail tenants should be money making machines via operating profits.” The Industry (RE)port reveals Claire’s overall EBITDA and EBITDA margin have been steadily decreasing since 2012, with Claire’s per store EBITDA declining at 35.3%, all while the industry has shown growth of 3.6%. 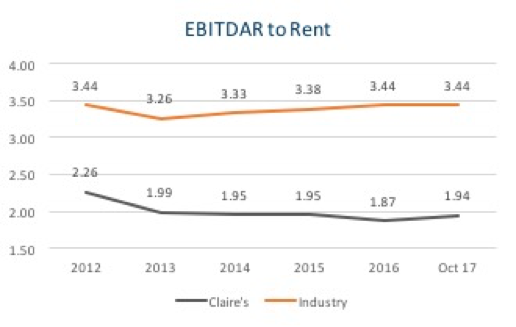 Claire’s EBITDAR rent coverage is on the same downward trajectory. Although the accessory industry has remained stable at 3.44x, Claire’s rent coverage has declined from 2.26x to 1.87x. The (RE)port indicates that unless Claire’s turns the corner to increase its operating and net profits, the retailer may find itself in another set of undesirable statistics — ones that track store closures.